Recovery is a path, with plenty of milestones along the way. These markers are encouraging turning points that keep you going in the right direction and they’re an essential part of recovery. But how do you get to these places of victory? Milestones are actually the goals that you set and, ultimately, reach. 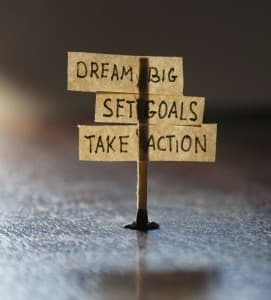 Whether the process is addiction recovery, weight loss, or career advancement, goal-setting is key. People who have goals feel more purposeful and are more likely to accomplish successful change in their lives. It’s certainly worth pointing out, however, that not just any goals will do. Poor goal-setting methods can hinder the process rather than help it. When you’re creating your recovery goals, there are many different variables that should be considered. Everyone’s goals should be personalized and prioritized, meaning milestones and successes will vary from person to person. Though unique, the best goals have similar attributes and, most importantly, follow the S.M.A.R.T acronym. – specific, measurable, attainable, realistic and timely. The following guidelines will help you set healthy and S.M.A.R.T recovery goals. Be realistic – You will only hurt yourself if you set unattainable goals. Don’t set yourself up for failure. Establish goals that stretch you, but are realistically within reach of that stretch. Unrealistic goal: I will land my dream job by the end of the week. Realistic goal: I will find at least part-time employment in the next six weeks. Be specific – Goal-setters often make the mistake of creating vague goals. These do not provide enough guidance for the steps necessary to reach the goal. Non-specific goal: Get a job. Specific goal: Obtain employment at a minimum of 30 hours per week and $15 per hour. Break it down – Once you have a specific, realistic goal, break it down into steps you will complete to reach it. Even if you have narrowed the focus of your goal, you will need to come up with concrete smaller goals that make up the larger objective. Main goal: Obtain employment at a minimum of 30 hours per week and $15 per hour. Update my resume in the next week. Search for jobs online for one hour each day. Submit at least two job applications per day after resume is complete. Set measurements – How will you know if you have met your goal? Some are easier to measure than others. If your goal is employment, a full-time job could be the measure of success. What if the goal is relational? This is harder to measure, but still possible. For example, if you hope to restore a broken relationship, a measure of goal success could be sending an apology letter, or setting up a meeting with that person. Set time limits – Don’t leave your goals open-ended. This tends to create a “some day” mode that rarely results in goal attainment. Goals work better with deadlines to spur us into action. Limitless goal: Obtain employment at a minimum of 30 hours per week and $15 per hour. Timely goal: Obtain employment at a minimum of 30 hours per week and $15 per hour within the next six weeks. Know that, as you plan your goals, you may have a few setbacks along the way. But experiencing speed bumps does not mean you are a failure; it simply means you are human. Give yourself grace – Know that, as you plan your goals, you may have a few setbacks along the way. But experiencing speed bumps does not mean you are a failure; it simply means you are human. If a goal is not reached in the time parameters you set, you don’t have to throw your hands in the air and quit. Allow yourself room to grow and learn through this process. This does not mean excusing behavior or rationalizing away poor choices. It does mean you accept imperfection and are ok if you do not reach every goal you set in the way you planned. Be flexible – This step is closely tied to #6. If you are unable to meet a goal, or it becomes clear you have a goal that is no longer viable, change it. These are your goals. Own them. Part of the recovery process is developing new healthy habits, and your goals may need to change as you do. Some circumstances are out of your control. Be prepared to revise timelines, specifics, or entire goals if needed. If your goal was to restore a relationship, but that person is not open to the idea, complete the apology and contact steps you set, and know you have done what you could. Perhaps this goal can be put on hold, or tried with a different relationship. The important thing is to make new goals, not simply discard the old ones. Find helpful resources – You’re not an island. Resources are available as you set out to establish recovery goals. Support groups, family, friends, online sources, and therapists are a just a few of the resources typically at your disposal. Depending on your aims, goal-specific resources are often available. With a job search, for example, unemployment offices offer myriad resources, and online networking sites such as LinkedIn are great tools. Embrace accountability – Don’t try to run the race alone. As you set goals, share them with someone. This could be a friend, member of a support group, a mentor or sponsor, or family member. Ask them to hold you accountable for both small and large steps. Knowing they will be asking if you completed those job applications or made that phone call will encourage you to finish the tasks you set out to do. Learn more about drug abuse and the recovery process.